An old mobile adds a spark to one family’s history. As my youngest daughter drove up to our annual family reunion picnic, the summer breeze blew past where I was standing and a flashback of time hit me. I recalled being at the same family reunion picnic. It was a hot and sunny summer day and we were sitting around a shade tree at the picnic. 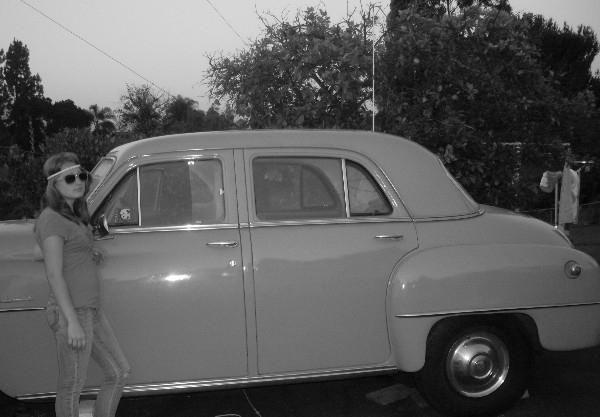 I looked around and saw my father driving up in his old 1952 Plymouth Cranbrook. He bought it new back in ’51. I heard all the kids say, “Far out, look at that old car!” As my father sat down, I asked him if he still had the old ham radio in it. He looked at the car and said, “Yep and it still works too.” My youngest daughter ran over and said, “Wow! Grandpa that is a big radio in the car.” I asked my dad to tell us the story about how he got the radio. It was always a good story. He looked at us and asked us to sit down and he began this story. When your dad was about 12 years old, I came home one day with a new car; it was a pear green 1952 Plymouth Cranbrook. Your dad stared at the car for hours. He looked at the inside and out of the car with a ruler in his hand. I was perplexed by what he was doing. He walked over to me and said, “If I get my Amateur Radio license can we put a transmitter in the car?” I had my Extra Class license for just about 3 years and had asked your dad if he would like to get his Novice license, but he was not interested at the time. But now, with the new car, he was very interested. Your dad read all my QST magazines and told me all about the Elmac A54H and that it could run on 6 V from the car’s battery. I had to think about this. The radio cost $175 new at the time. With the new car and the Korean War going on cash was going to be tight. I told him if he got a summer job mowing lawns like I had been asking him, then I would help him get his Novice license. Your dad asked all my ham radio buddies in the area if he could mow their lawns. He told them that if he got his Novice license, he was going to get the Elmac A54H and put it in the Plymouth. All my ham buddies jumped at the chance to get a new ham radio operator on the air. Your dad started that week mowing the lawns. He picked up more jobs as neighbors saw him mowing. It took him a little over a year to get $112, he was almost there. He passed his Novice test and was waiting for his call in the mail. With a Novice call back then he could operate some CW on the 80 and 40 meter bands. 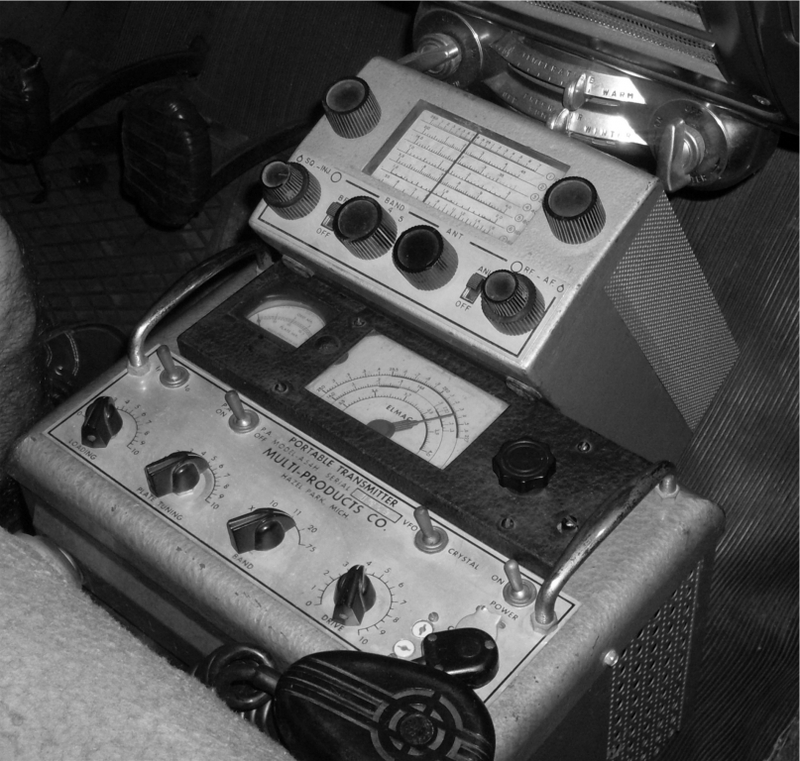 The Elmac A54H was an AM phone transmitter and he was going to have to work third party until he upgraded to General. Well, your dad worked more and saved up $135. Then I pitched in and we ordered the radio. While we were waiting for the radio to arrive at the store the Armistice was signed and the Korean War was over; that was on July 27, 1953 and my brother, your great uncle, was going to come home. We had not seen him since the US started sending troops to the Korean conflict in 1950. We lived in an apartment and could not set up an Amateur Radio station. We had to use my buddy’s station. 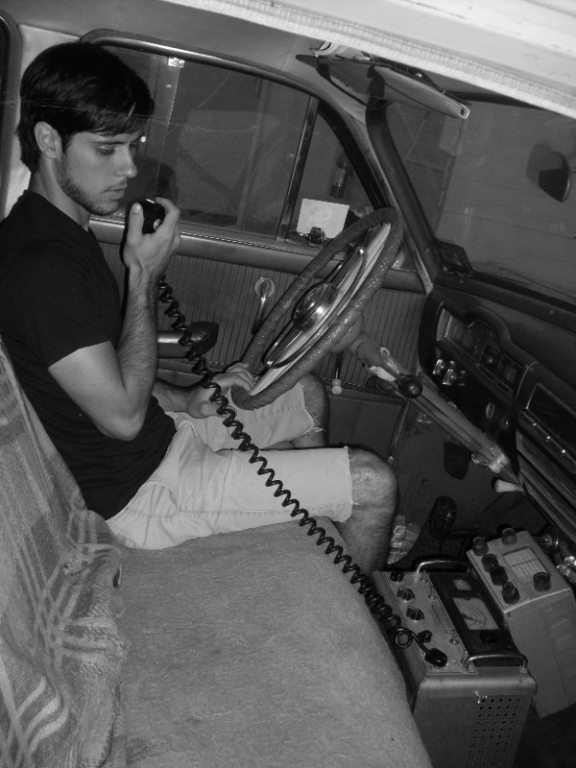 When the radio arrived, we got right to installing it in the Plymouth. It took most of the afternoon. We took our time wanting to get it right the first time. We mounted the whip antenna on the car first and moved inside to mount the radio. We made a direct power connection to the battery and brought the leads through the firewall right next to the heater hose. The radio was mounted right under the car radio, but it stuck out on the passenger side just a little. Your grandma came out and asked how it was going? I told her we were done and ready to test it. She opened the back driver’s side door and sat down. I called CQ and no one answered back; as I recall the bands were dead. She then got out and closed the door, but the door would not latch and to this day we always have to close the door twice to secure it. A day or so passed before we got the opportunity to operate the radio again. I came home from work and the bands were hopping. A station was working some phone patches and another was sending messages to and from Korea. We listened for a while and they were calling for any station in our small town. I jumped and gave my call. They came back and asked if we could deliver some messages in our neck of the woods. I sent your dad in to get some paper and pencils. He came back with his school tablet and three pencils. We must have been on the 10th message. It turned out it was for us from your great uncle. It read: “My unit is packing up and coming home, will get in touch with you when back in Seoul to regroup and will have date when we head back to US.” We delivered all the messages to the town folks and they gave us more messages to send back to the troops. It’s a good thing we got the radio. Your dad had a great idea. When we were not sending and receiving messages to and from Korea we both worked some DX. Your dad upgraded to Technician that summer. We had so much fun working together, I told him, “There will come a time when I will pass this car to you.” With a smile ear to ear, he just gave me a hug. We were working some message handling when the message from my brother came in that he was in Seoul and should be back in town next week. When he arrived, we went to the park and had a picnic, right here in this park. We always have the annual family reunion picnic the third Saturday in August, same tree, same park. “What a story Grandpa!” My youngest one shouted out. Every now and then at the picnic the story would be told to the little ones when they saw him drive up in that old Plymouth. I’m now holding the Extra Class license and received my dad’s old Extra Class call after he passed away in ’91 and true to his word that old Plymouth showed up in my driveway with the radio still working and extra tubes in the trunk. Now, I follow in his footsteps. As I get older and drive up to the picnics and all the kids swarm around the old car and look at the radio, I find myself sitting under the same tree telling the same story. Grandpa will be at the picnic in our hearts. Yes, I did promise the old 1952 Plymouth Cranbrook to my youngest daughter. It will be up to her to keep the memories and pass them down to the next generation. The door will probably never get fixed, but that’s okay, it’s just one of those things that adds character to the car. So, if you see an old pear green ’52 Plymouth sitting at a park with a whip antenna, stop by and ask to hear the story. It’s worth it. 73 and may you always remember how important your family is. Photos by Paul Rios, KC6QLS. Equipment supplied by Patrick Bunsold, WA6MHZ. Les Volta, NP6LV, is the pen name for a character who is a little bit of me, a little bit of you and a little bit of everybody who may be heard on the Amateur Radio bands. Les is 96 years old and married. He served in World War II and Korea, and retired as captain from the United States Navy. He was a pilot who flew the PBY-40 aircraft in WWII and flew jet planes in later campaigns. In the stories, from time to time, he reflects on his personal experiences during the wars, growing up, meeting his wife, family ties and shares Amateur Radio related experiences with his readers. The stories that Les Volta tells always have some connection to Amateur Radio be it a character, a contact, an experience, sharing about Amateur Radio equipment or the hams he has met in his life as an Amateur Radio operator. You can contact Les at lesvolta@cox.net.